Numbers is a very practical addition to the other iWork apps on iPad. In Numbers, every tab displays a sheet, which can have one or more tables or charts (or both) on it as well as graphics and text frames. Tabs help you organize your Numbers documents. Tap the plus sign (+) tab, and Numbers asks whether you want to add a new sheet or a new form. 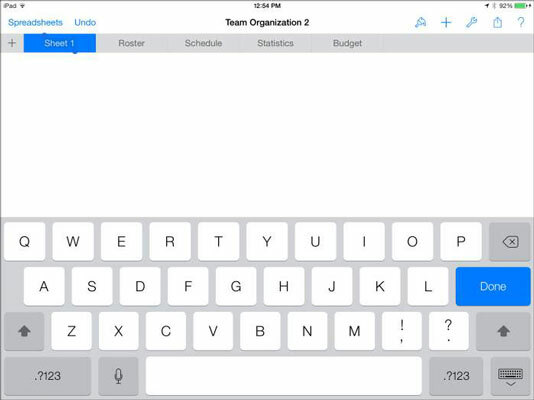 Tap New Sheet, and Numbers creates for the sheet a new tab that contains one table. (See the figure.) The sheet is labeled Sheet 1. All you have to do now is tap the option (Duplicate or Delete) for the action you want to take. Remember that a double-tap opens the tab so you can edit its name. A single tap brings up the selection buttons, if they’re available for the object you’ve tapped. If you have more tabs than can be shown on the screen, just flick right or left to slide along the tabs. Remember to flick in the row of tabs. Flicking the body of the sheet scrolls over to the right or left of the content on that sheet. If you’re holding iPad in portrait orientation, turn it to landscape orientation if you want to allow more tabs to display on the screen. Double-tapping text anywhere on iPad allows you to edit the text. The same statement applies to tabs, too. Double-tap the name of a tab to begin editing it. (See the figure.) The onscreen keyboard appears and you can delete the current name and enter a new one.